Original content posted March 2015. Updated March 2019. What’s your stance on Irish food? Me? I could take it or leave it. It’s not my favorite, but I would eat it on occasion. My husband? He’s a huge fan. HUGE. My guess it’s likely because of his love of all things meat and potatoes. Before we had children, I would make him this Best Reuben Casserole each year. All was well until we welcomed our second child to the world on St. Patrick’s Day. Unfortunately for my husband, she has yet to request this reuben casserole recipe as her birthday meal. So instead, I simply make it earlier in the month for him to enjoy. What Makes the Best Reuben Casserole? 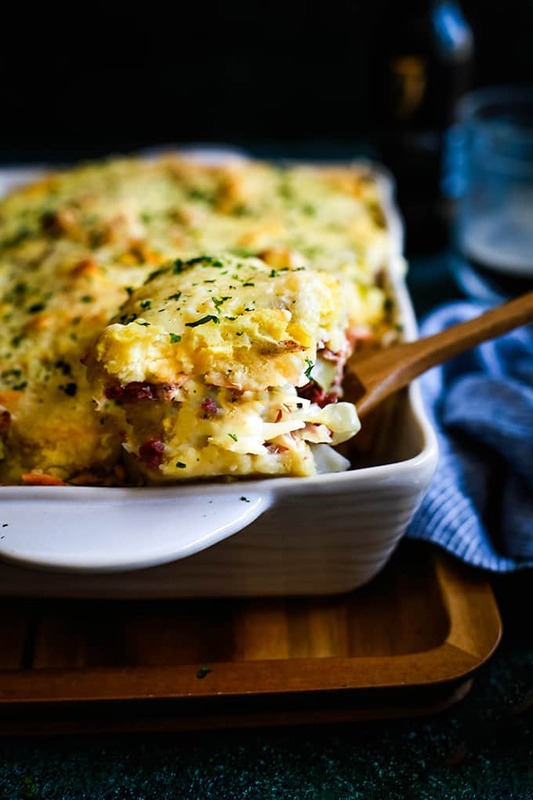 Forget adding bread that can get soggy to this comforting casserole! Instead, I make the Best Reuben Casserole with mashed potatoes! 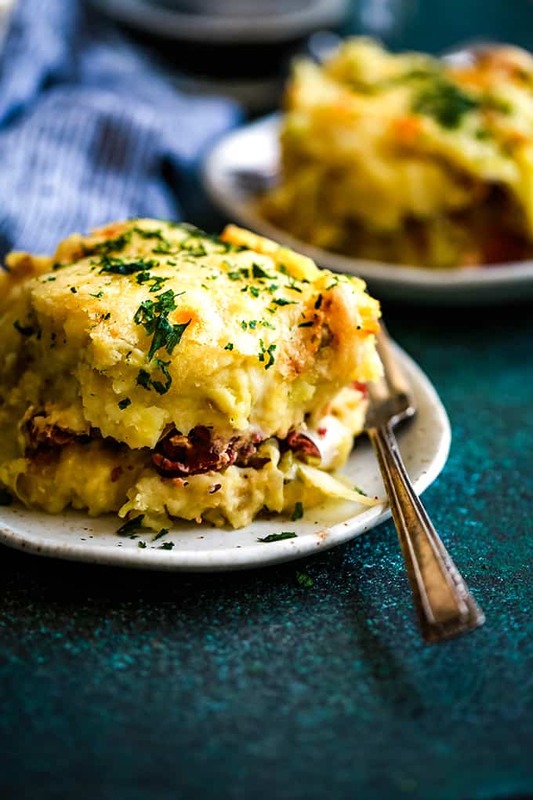 Corned beef and cabbage are sautéed in dark beer and topped with a homemade thousand island dressing before being sandwiched between two thick layers of mashed potatoes studded with Swiss cheese. One 9″ x 13″ pan of this hearty recipe can feed a crowd and is without a doubt the Best Reuben Casserole recipe. 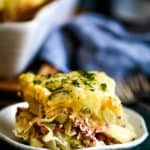 Without a doubt, my husband’s love of this reuben casserole was also the inspiration behind this comforting Reuben and Guinness Mac and Cheese, appetizer turned main dish Chicken Reuben Sheet Pan Nachos and mashup Reuben Waffle Fries. In short, I know if I transform any dish into a reuben it will be well received by the love of my life. In a large dutch oven, add potatoes and cover with water. Bring to boil until easily pierced with a fork. 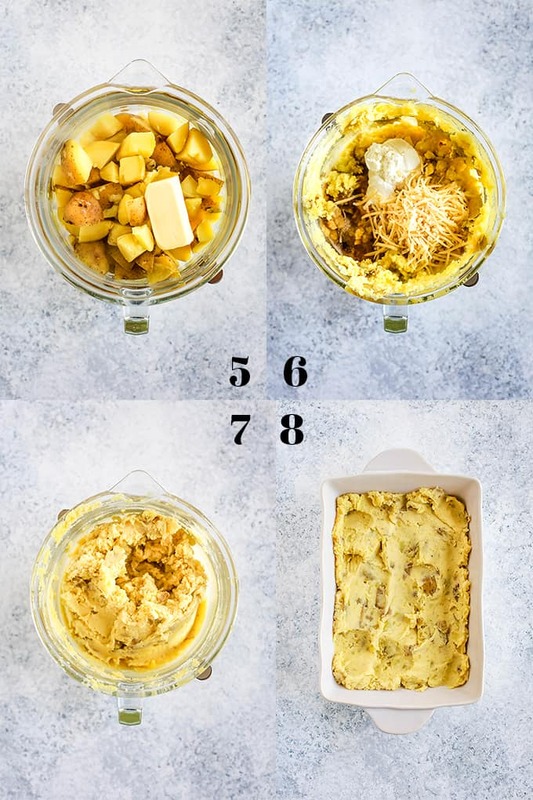 TIP: I love to use Yukon gold potatoes for this recipe as they have a more buttery taste and their thin skin means no peeling! You could also choose to use a more traditional Russet potato, but you would want to peel them beforehand. Meanwhile, in a large saucepan over medium heat, add corned beef, garlic, caraway seeds and beer until corned beef is warmed through. TIP: Don’t be tempted to use a bag of presliced cabbage for this recipe! Slicing your own means that it will stand up to being wilted in the saucepan and baking. The presliced variety is too thin. 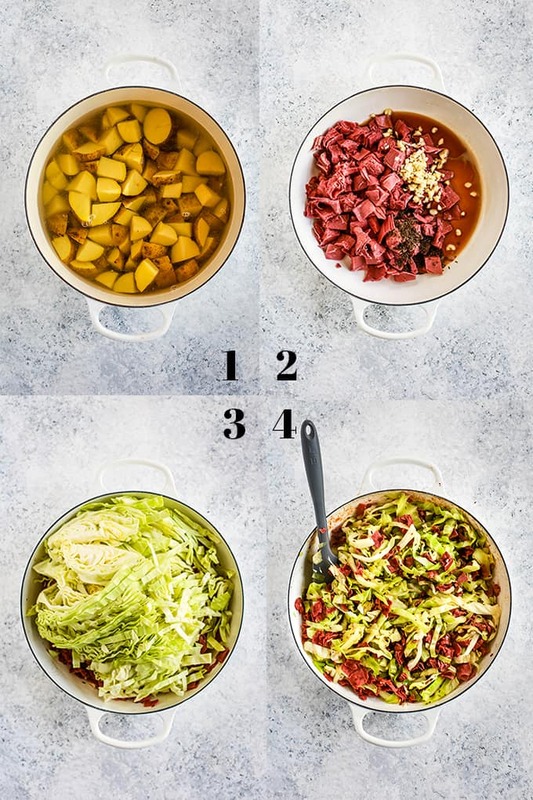 Stir and toss cabbage with corned beef until wilted and beer is reduced. Set aside. Add potatoes to bowl of an electric mixer fitted with paddle attachment with butter and mix until just combined. TIP: Only mix until the butter is melted and only a few lumps remain in the potatoes. Add beer, yogurt and 1 cup of cheese to bowl. TIP: Don’t have any yogurt on hand? You could also substitute a good sour cream as well. My favorite is Nancy’s Organic Cultured Sour Cream. TIP: Mix only until no lumps remain and no single ingredients are visible. 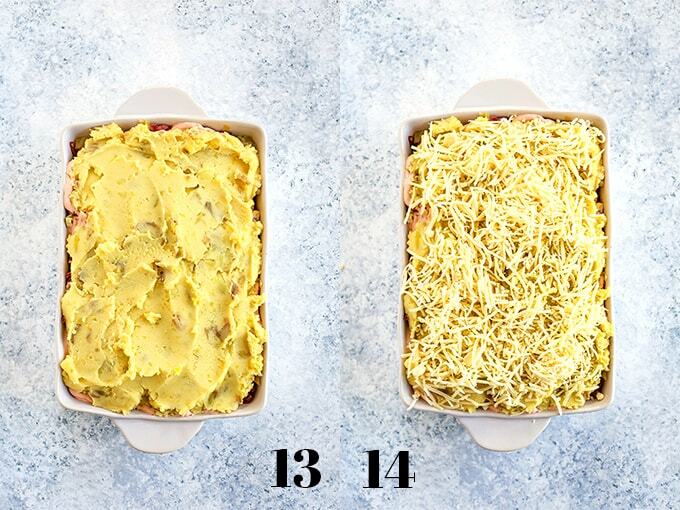 Spread half of mashed potatoes into the bottom of a greased 9″ x 13″ baking dish. Using a slotted spoon, spoon corned beef and cabbage mixture over potato layer. TIP: Using a slotted spoon insures that any remaining liquid isn’t transferred to the baking dish which would make for a watery casserole. YUCK! In a small bowl, add yogurt, ketchup and relish. Spoon over cabbage and corned beef mixture, and use a spatula to spread into an even layer. Spoon remaining half of mashed potatoes over dressing. Sprinkle the additional 1-1/2 cups shredded Swiss cheese over mashed potatoes. Bake at 350 degrees for 25-30 minutes or until bubbly and top of casserole is golden brown. If you’ve tried this Best Reuben Casserole or any other recipe on Melanie Makes, please let me know your thoughts in the comments below. I love hearing from you and respond to each and every comment! In a large dutch oven add potatoes and cover with water. Bring to boil until easily pierced with a fork. Add cabbage to saucepan and stir until wilted and beer is reduced. Set aside. Add beer, yogurt and 1 cup of cheese to bowl. Mix until just combined. In a small bowl, add yogurt, ketchup and relish. Stir together until completely combined. Bake for 25-30 minutes or until bubbly and top of casserole is golden brown. Adapted from Cooking Light's Reuben Bake. The reuben obsession continues! After finishing off this Best Reuben Casserole, I’ve also added these easy Reuben-Stuffed Twice Baked Potatoes, crowd pleasing Reuben Pretzel Sliders and super fun Reuben Egg Rolls with Thousand Island Dipping Sauce to our must make list! I am sure this will b e a huge hit at my house!! I have no doubt, Sandra! 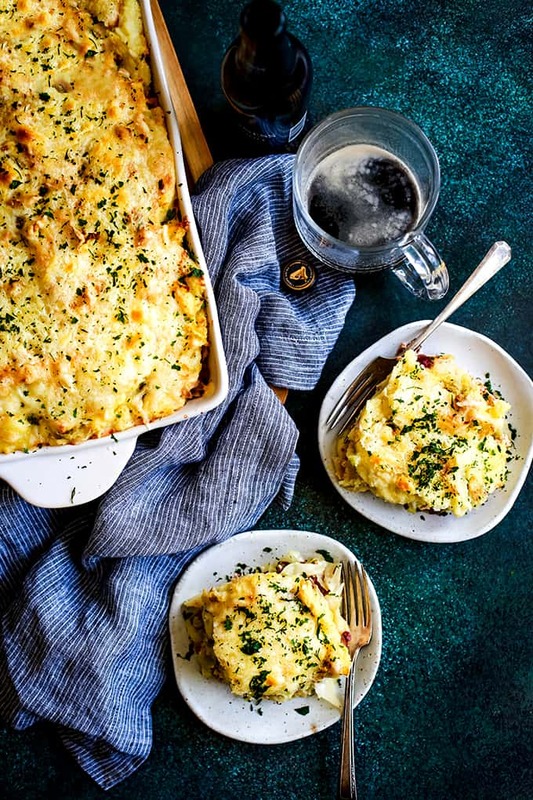 This casserole is perfect for St. Patrick's Day, but I would have to make this year around for my family. That happens at our house, too! 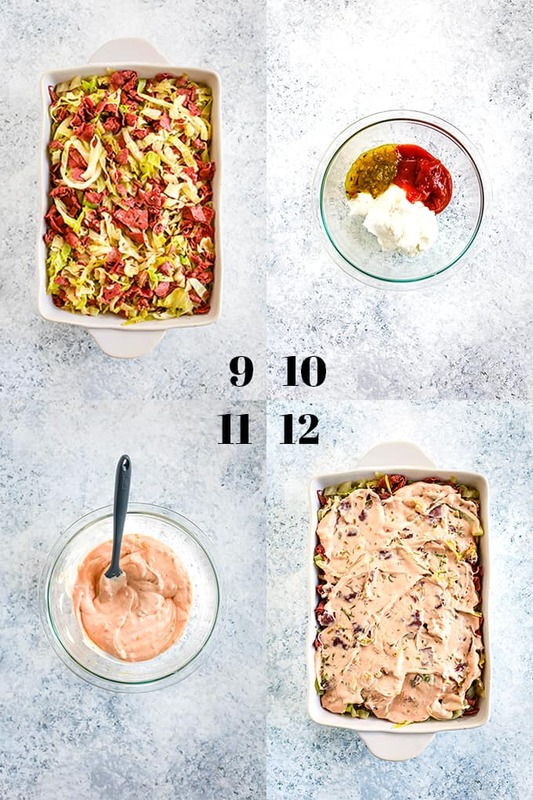 A Reuben is my favorite sandwich so I have got to try this casserole this weekend!! Can't wait to hear what you think, Lora! This is my kinda Reuben... casserole form. I've been making this for quite a while now and I'm just getting around to reviewing this. I really enjoy this casserole. Awesome flavor! Thanks for posting. So glad you enjoy it, Chrissie - thank you! Such a fun meal to celebrate the holiday. It's pure comfort food. Love all of your tips and tricks to getting this right, especially slicing the cabbage myself. I usually like to take shortcuts so it's good to know that one won't work. Thanks so much, Jen! I'm the same way about shortcuts! I can't wait to give this a try! Looks SO good! This looks like a must try for me! I love reubens! I bet you'd love these nachos, Michelle! Such a fantastic idea!! I can't wait to try it! This will be a hit in our house! I love casserole dinner! My husband absolutely loves it, Abeer! I love a good Ruben!! I can't wait to try all of these new versions! my brother just texted me the other day about trying to casserole-ify a sandwich (monte cristos I think.) this is GENIUS!!! All things meat and potatoes! This looks deli! I think I will have to have this next time we have some corned beef. Thanks Melanie for the share! Let me know what you think if you give them a try, Jocel! I can't say that Irish food makes me want to jump up and dance (although the beer? maybe), but this casserole looks truly delicious! It has been so long since I had a Reuben. This casserole is making my mouth water! I bet you'd love this, Amy! I know I would love this! I can never turn down a Reuben sandwich! Then you'd absolutely love this, Michelle! My husband and I LOVE Irish food. We could eat corned beef and cabbage every night! This looks awesome - I can't wait to make it! This would be a perfect dish for the two of you, Amanda! Now THIS is comfort food! So perfect for St Patty's Day! This is the ultimate irish dish! Although I am irish.. I've never had corned beef. But I do love potatoes! I'm such a fan of potatoes, too Beth - I bet you'd love this! 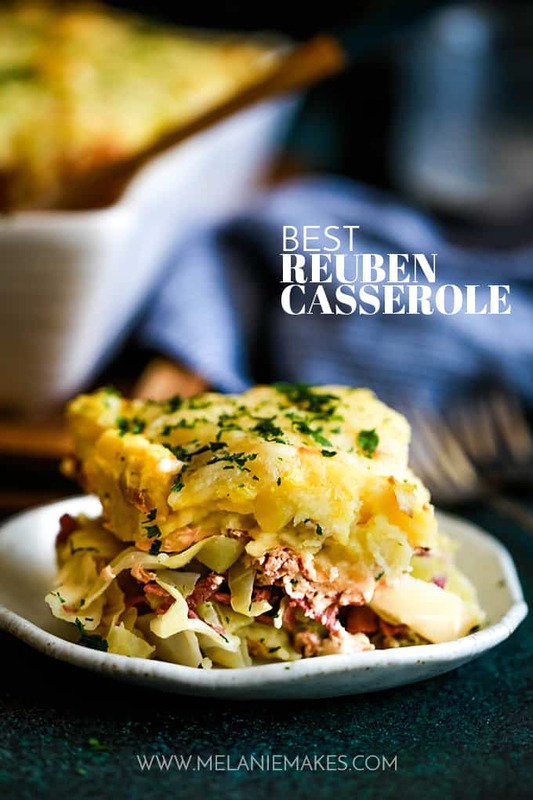 I am a big fan of reubens but I have never thought of putting them in a casserole before. Thanks for the idea! Reubens are just okay in my book but mashed potatoes? Um, yeah, that's why I find this version so delicious! I absolutely love that you used nonfat yogurt in the dressing and mashed potatoes. Plus the addition of dark beer? This is a winner for sure! Kristen, I can't tell you how much nonfat yogurt I go through in a week - love that stuff! Comfort food to the extreme, Krista! Hope you give it a try! Reuben is my Hubby's favorite sandwich! I NEED to make this for him! I think this is a definite husband approved meal, Anna! 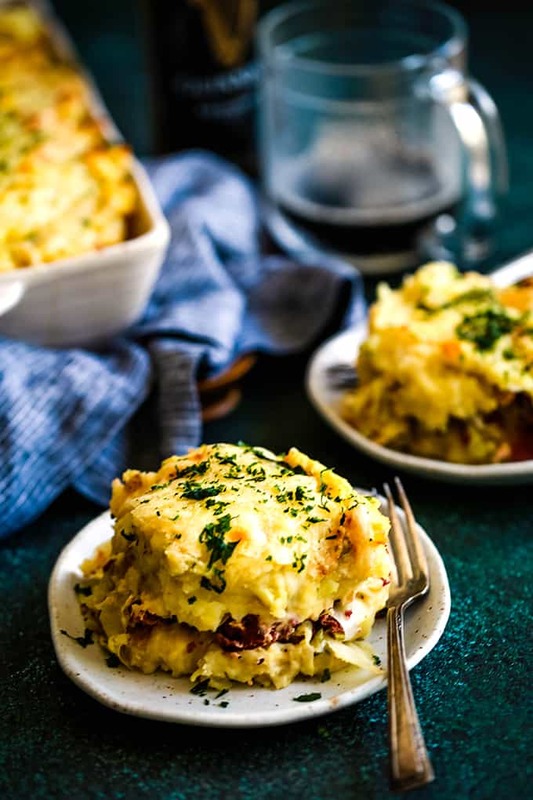 my husband and I both really LOVE Irish food, especially corned beef and cabbage, so this casserole would be a BIG hit with us. and how could you go wrong with meat sauteed in beer. I have no doubt you'd both love this, Heather! This is definitely a perfect husband meal, Jenn - I think you'd both love it! I say pair this with your favorite Irish drink and you're golden, Em! Melanie, My spouse has a casserole that he just loves and I . . . well it's fine. Just fine. But the kids love it too, so I make it fairly often for the rest of the bunch. Luckily they are happy to eat up all the leftovers too--and it's mindless for me to make. I love Reubens, and this looks like a terrific casserole to me--also a great way to thank your spouse. Thanks! I definitely am one of those people that thank people with food and this was an ultimate thank you! And I'm so glad I revamped the original so it's delicious for everyone and not just tolerable! You are killing me with these recipes, Melanie! 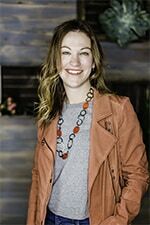 Even though I am a vegetarian, you always have me intrigued with your recipes since my husband loves any hearty, meat recipe! Talk about the ultimate compliment - thanks so much, Kacey!